For tiny Norway, a country of 3 million people, the reality of World War II struck at dawn on April 9, 1940, as massive German air, sea and land forces invaded the neutral country. Airborne Nazi forces secured the airport at Oslo, the capital. Simultaneously, Nazi soldiers secured the main cities of Kristiansand, Stavanger, Bergen and Trondheim in southern and western Norway. Invasion forces included many Germans who had been sheltered by Norwegian families after World War I, and who thus were well-acquainted with the country. The Norwegians never had time to fully mobilize their small army. The soldiers retreated to the mountains and to northern Norway, where they joined British and French troops to continue the fight against the Nazis. However, the rapidly reinforced German troops and Luftwaffe superiority resulted in the withdrawal of British and French troops, and on June 7, the Norwegian king and government sailed for England aboard a British cruiser. Before leaving, they proclaimed their intention of fighting on from abroad until their country was free again. The German seizure of Norway was designed primarily to gain bases for repeated attacks on Allied sea-lanes, and to ensure the safety of vital shipping lanes down from the northern part of Narvik – a major outlet of iron ore from neutral Sweden. German submarines based in Norwegian harbors and fjords struck throughout the north Atlantic. The Nazi air force, based in northern Norway, sent bombing and torpedo squadrons against Allied convoys carrying supplies to Murmansk in the Soviet Union. The Norwegian military Resistance Movement in Norway contributed to the Allied cause throughout the war. The Norwegian fight against the Nazis was begun they day of the invasion, when more than 1,000 Norwegian merchant ships – 80 percent of the merchant fleet – headed for Allied ports. And throughout the war, Norwegian young men escaped to neutral Sweden or across the North Sea in small fishing boats to Scotland and England. In England, the Norwegians and British set up Company Linje, a special forces unit which sent many Norwegians back to their homeland to establish wireless radio contacts and sabotage German installations, transportation and shipping, in cooperation with the local Norwegian secret military called Milorg. Many young Norwegians lost their lives during these operations. Norwegian civilian resistance frustrated the much-hated Norwegian traitor Vidkun Quisling and his fellow traitors in the puppet government “Nasjonal Samling,” which meant “national unity” according to the Norwegian Nazis. The German Josef Terboven, head of the Nazi “Reichskommissariat,” was in charge, but allowed the “NS” to attempt nazification of the Norwegian people. This set up a continuing contest between nazification and resistance. During the occupation many teachers were arrested and sent to prison for not teaching Nazism, schools were closed periodically and some pastors sent to prison for not cooperating with the Nazis, sports leaders were arrested for leading a strike boycotting Nazi-sponsored sports events and many local government officials were replaced by loyal Nazis. 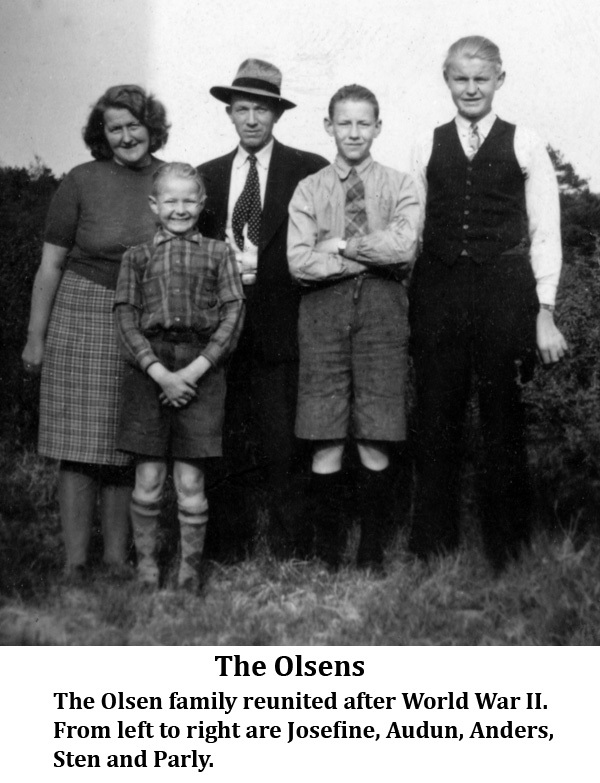 I do have many vivid memories of my life as a young boy living in Norway during World War II. 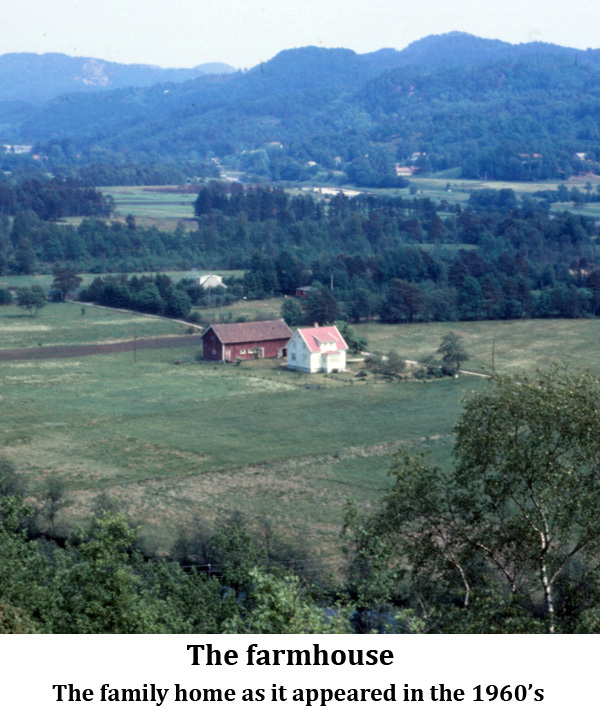 I was born April, 1937, on a farm adjacent to Lyngdal, a small town by a fjord on the south coast of Norway. My father, who had lived in the United States periodically since 1912, had traveled back to Chicago to work as a carpenter in 1938. 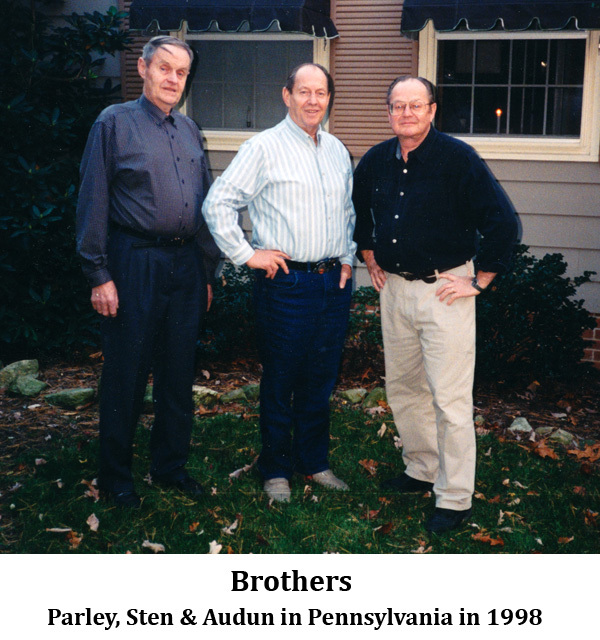 My parents had planned to move to America with their three sons, but World War II intervened. The German invasion of Norway on April 9, 1940, must have been a traumatic experience for me, because even as a 3-year-ood I can still picture the steady stream of German trucks, tanks and soldiers passing by on the road about half a mile from our house. I can recall that my mother, two older brothers and I were huddled in the kitchen as we peered out the window at this sight. I don’t even remember that I had broken my arm the day of the invasion and that all the medical personnel at the hospital had fled to the mountains because they feared a bombing attack. I’ve been told that about one week later the hospital was opened and my arm “Manipulated” and set. Except for that isolated event, my personal remembrance of World War II relate to my life as a 6-8-year-old during the period 1943-45. 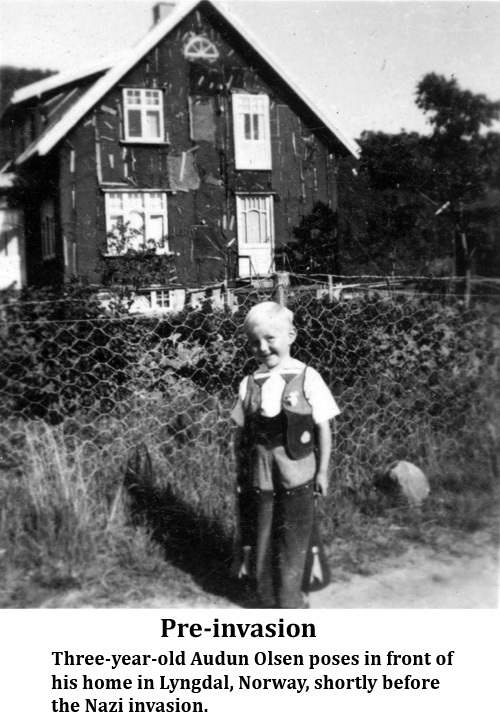 My mother and her three sons lived on a small farm close to the town of Lyngdal. The Germans had established a large camp consisting of about 10,000 soldiers just outside Lyngdal. We had very little money. My father in America could send a Red Cross letter which reached us in six months; we sent one back saying “we are all well,” and listed our four names. That’s it! No food or money could be sent. We had an old farm horse which a local man used to work on construction, and he split the earnings with my family. That money was enough to get along on, as the farm was able to provide foods such as eggs, milk, potatoes and cabbage. I recall that a large portion of the farm goods was confiscated by the Nazis, but we had a “friendly” local official who was not able to correctly “count” the number of chickens we had, nor find some potatoes hidden in another part of the barn. During the summer of 1944, German soldiers stayed at our farm. Officers confiscated two rooms in the house and the soldiers slept in the hayloft. They did not treat us badly. My older brothers had learned some German and the soldiers had learned some Norwegian, so there was communication. Many of the soldiers were Polish and Czechoslovakian, and were afraid to say too much. They would give us candy and other items. I recall watching military practice maneuvers outside our house in our fields. Soldiers would hide behind hedges by our house and shoot (blanks) at the advancing “enemy.” My hobby was to go around the fields to collect empty rifle shells and clips (five shells to a clip). Once in a while we would find loaded, wooden prop rifle shells. We would build a bonfire, put the bullets on top, light the bottom, and run behind a mound to watch it explode after a few minutes. One time, German officers came riding their horses down the road as we were waiting for the explosion. We were scared! Luckily, they raced past and the explosion took place when they were out of sight. By 1943-44, the Germans had built many prisons in Norway, especially for Russian prisoners. We saw them marching by on the way to work detail. One time a foolish local man went up to a Russian soldier to shake hands. A German guard approached him and shot him dead on the spot. I have been told that the Russians were treated badly, and many died from malnutrition and German atrocities. But I do recall that toward the end of the war, the German soldiers were more lenient. We traded eggs and foodstuffs with the Russian prisoners and they would give us beautifully carved, colorful wooden birds and other figurines in exchange. In 1942, all Norwegians had to turn in their radios. Prior to that time, the Nazis and Quislings tried to use radio for propaganda purposes, but the people preferred listening to the Norwegian announcers and their King broadcasting on the BBC from London. I remember accompanying my mother after the liberation I n1945 to pick up our radio at a local depository. 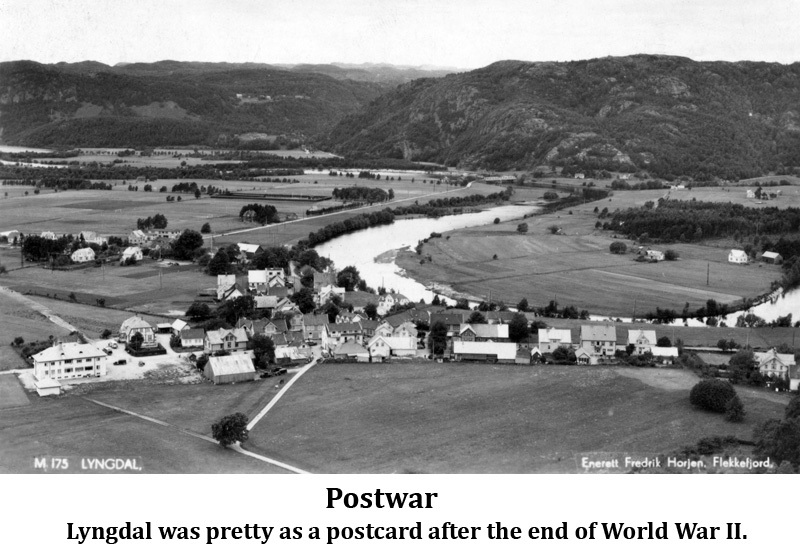 During my recent visits to Norway to research the subject of the Nazi occupation of Norway, 1940-45, I have been informed by a number of people that I was very lucky by living in the town of Lyngdal during the war. Many towns on the west coast and in the north were bombed heavily, first by the Germans during the invasion, and later by the Allies attacking the German installations, submarine bases, ports and airfields. During 1944 and into 1945 the Allies bombed relentlessly. A newspaperman who interviewed me showed me a yearbook from his elementary school in Bergen, which pictured about 120 young boys and girls killed by an Allied raid on a German military installation next to this school. This was during the winter of 1944-45. While my town seemed relatively quiet, I have since learned that the area was a beehive of underground activity. In 1943, our family physician was taken to Grini prison by Oslo (this was the infamous prison for Norwegian political prisoners) and later killed. Working for the Norwegian Underground, he transported and aided Norwegian military groups that came from England. These men landed on the south coast of Norway and moved inland to sabotage predetermined German targets. On my last visit to Norway, I interviewed a local man named Johan Vegge, a 74-year-old who had worked in the Norwegian Resistance Movement. He spent three hours one evening talking about a failed sabotage operation during the winter of 1943-44. Twenty-five Norwegian “Linje” man from England were landed by British submarines on the south coast. Their assignment was to blow up a large manufacturing plant further inland. The Nazis found out about their operation, and these men were chased throughout the mountains close to my town on Lyngdal. The Vegge family and others in the underground network helped these men. The men hid in mountain cabins and were brought food daily. The German presence in the area soon became very dangerous, and Johan Vegge and others fled across country roads to neutral Sweden. He became part of the Norwegian military in Sweden and later was sent to northern Norway to join the Soviet/Norwegian attack against Nazi positions. His family members back home were caught and sent to prison. His father and brother died in prison, but his mother returned after the war. A man named Gunvald Tomstad was much hated as a Norwegian Nazi in the town of Flekkefjord. German soldiers would visit his home for parties, and he was well-liked by them. After a few drinks, they would talk. Later that same evening, he would go up to the attic, set up his wireless, and transmit messages to England regarding German shipping and operations in Norway. The famous chase to “sink the Bismarck” actually started when Norwegian Underground members sighted the giant German battleship off the southern coast of Norway and informed Gunvald, who then sent a message to the English regarding the location of the Bismarck. By late 1944, many of the Norwegians involved in the underground were identified. Many were arrested and killed, but quite a few were able to escape to neutral Sweden or England. Gunvald Tomstad was one of the lucky ones, as he was picked up by an English submarine and taken to England for the duration of the war. Many Americans are familiar with the “heavy” water (deuterium oxide) plant in Rjukan, 100 miles north of my hometown. The Allies were extremely concerned that the heavy water could be used by the Nazis to control fission and thus complete their atomic bomb project back in Germany. The destruction of the Rjukan plant was made a top priority item. At first, Allied bombing raids could not penetrate the mountain fortress. Next, British paratroopers were sent in via gliders. The gliders crashed and over 60 men were killed. Then, a daring operation was carried out by seven Norwegian “Special Operations” soldiers from England and one local Norwegian engineer who had worked at Rjukan. These men parachuted into a desolate area far from Rjukan, spent months preparing for the operation, and one night managed to sneak past guards into the plant, set explosive, and escape into the woods as they watched the factory blow up. During spring, 1944, the Germans were concerned about an invasion by the Allies. They had spent years building “Fortress Norway” as they called it, with heavy coastal installations along the western and southern coast of Norway. The large Nazi contingent in Lyngdal had also made preparation. I recall tagging along with my older brothers and their friends as we visited the German soldiers in their mountain fortifications. They knew us by then and were relatively friendly. But we had one frightening experience. On one occasion, as we were crossing a bridge, a Nazi guard positioned there to look for signs of enemy ships in the fjord did not see that my inquisitive brother Sten, 11, pushed a button installed on the bridge. This set off an alarm back at German headquarters and soon we saw tanks, trucks and soldiers approaching the bridge. We were caught! The German officer in charge held a gun to Sten’s head. A local Norwegian official spoke to the German commander, and eventually we were released. We were extremely fortunate! During the winter of 1944-45, Russian and Norwegian forces attacked German positions in northern Norway. The Germans retreated, burning and looting everything along the way. Most local Norwegians were able to escape and hide in mountain cabins. As the war approached an end during spring, 1945, many people were afraid that the remaining 300,000 Nazi troops would likewise destroy most of central and southern Norway. However, after the German surrender on May 7, the Nazi military in Norway laid down their arms and waited peacefully in their camps for the English and Norwegian military to take control. Norway was liberated! The Allies pressured the Soviet Union to leave northern Norway immediately. A number of German and Norwegian Nazis, including Josef Terboven, committed suicide. The traitor Vidkun Quisling was tried and executed. I recall that some of the German soldiers came out of their camps during those early days of the liberation to beg for food. They did some work on our farm, and we gave them bread and eggs. To “eat” an egg, one German soldier jabbed a hole in each end and sucked out the “food.” I was impressed, but I did not copy this practice. During the month of May, 1945, Lyngdal and the rest of Norway was the site of jubilant celebration. Prisoners were set free and joined loved ones, soldiers came down from their hideouts in the mountains, the people in Flekkefjord found out that Gunvald Tomstad was a “hero” who worked for the Allies, and all of Norway waited for the King and government officials to return from exile in England. At the time of publication, Olsen was a professor in the Communications/Journalism Department of Shippensburg University. He is now retired.